But is that really the case? Email is still ubiquitous in nearly every office space around the world. It’s free to use. It’s universally understood. And now, it integrates with pretty much every other app out there—including Zenkit! Regardless of your personal feelings towards email, the fact remains that it’s not a great place to collaborate or track your tasks. Things inevitably get lost, forgotten, or blown out of proportion, which is why tools like Zenkit exist in the first place. Here’s how you can dig yourself out of your pile of incoming mail using Zenkit’s email-to-collection add-on. Often you’ll come across emails in your inbox that you know can be delegated to someone else. 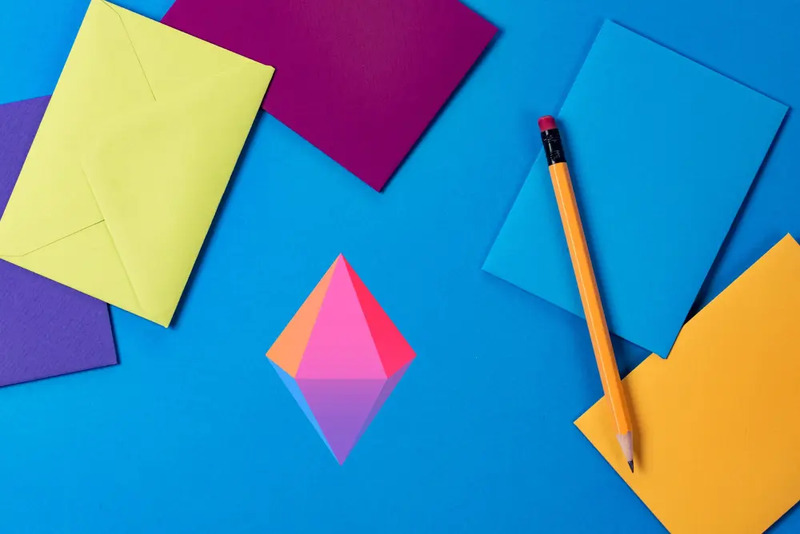 Rather than just forwarding the mail to their inbox—where it’ll inevitably get lost amongst everything else in there—send it to the relevant Zenkit collection and assign them automatically! To do this, click on ‘Show more examples’ under the collection’s main email address. You’ll see a list of email addresses, one for each person in the collection. Just copy the email and enter it into the ‘To’ field of your email to assign the incoming item to them! If you work as an assistant, secretary, virtual assistant, or a similar one-on-one job, you can create a collection of tasks for each of your clients, and share the email address of their collection with them. This way, they can email you tasks directly to your Zenkit collections without having to sign up for Zenkit or learn a whole new technology. The bonus is that you don’t have to triage your inbox all the time! Make tax season a little easier. You can create a collection called ‘Invoices’ (or something similar), and set that up to collect all your online billing info. Whether you forward invoice-related emails to the collection yourself, or set the collection’s email address as your billing contact for some online shops, you’ll have all of your invoices in one place! A lot of online tools and services send regular emails. Whether it’s a weekly report from your web analytics tool, notifications of new reviews about your app on the Play Store, or a weekly newsletter you subscribe to, collect it all in Zenkit! 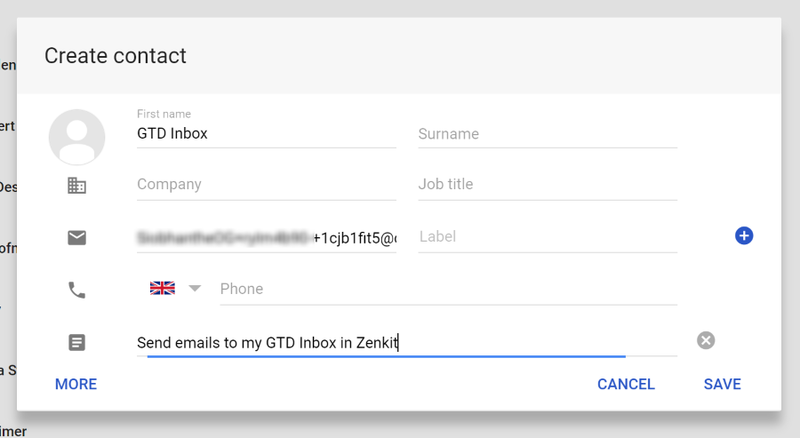 You can set your Zenkit email as the address receiving the notifications, or if you don’t want to do that, many email services will let you automatically forward emails that match certain criteria to a different email address. Share your collection’s email address with users, testers, or whoever you’re collaborating on ideas with to have their thoughts sent straight to your collection! This is great if you’re collecting feedback on a new product and need an easy way for people to tell you what they think, or you’re gathering bug reports from beta testers. It also works great if you’re crowdsourcing ideas for a new project, blog, book, etc. You can even use it to collect images for inspiration or when someone needs to include more detail in their feedback. You see where I’m going with this… you can use it for pretty much anything! Any time you want to collect information in one place, you can make it happen easily with email-to-collection. Of course, you can do the same thing for emails that assign a member to the item. Just remember to include info about the collection you’re adding to and the person you’re assigning. As I suggested in my last post, it’s really helpful to set default labels for new items in your collection. This ensures that if, for example, you work in the Kanban view frequently, that the item lands in the right list from the start, rather than you having to sort it into the right list after it’s been added. 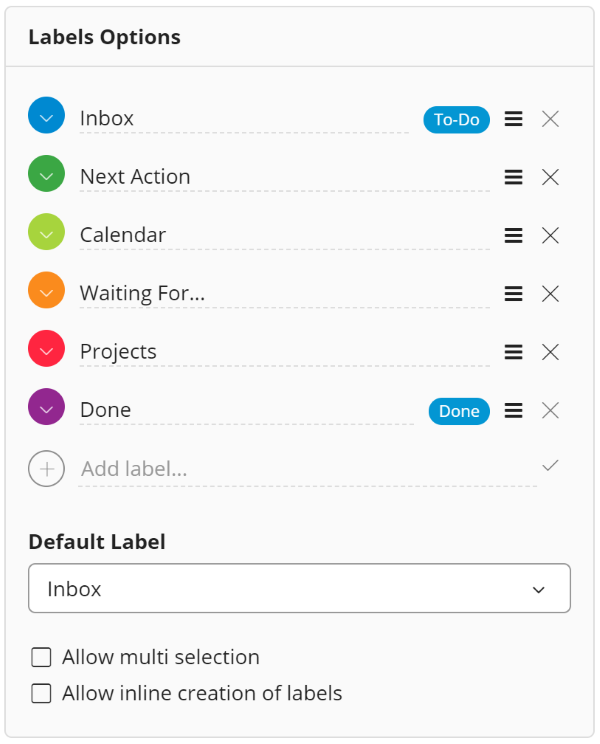 In my GTD collection, this means setting the ‘Inbox’ label as default in my ‘Lists’ label field, since that’s the label field I use to view my collection. To add a default label to a label field, open an item, click on the label field name, then click ‘Properties’. In the Label Options section, click the white selection box under ‘Default Label’, and choose the label you want. You’re not reduced to one label field though. You can add a default label for any field in your collection – Priority, Location, Stage, whatever you’ve got! Did you know that you can add labels to any item using # in front of the label name? Well, this works for email-to-collection too! If you’ve got labels like ‘to do’ or ‘high priority’ in your collection, you can add #todo and #highpriority to the subject line of your email, and those labels will automatically be applied! This is perfect if you don’t want to set a default label for a particular label field, but still want your email to have certian labels applied when it lands in your collection. And that’s it! There are thousands of ways you can use email-to-collection to make managing anything a lot easier with Zenkit. Have fun, and don’t forget to share if you’ve come up with a unique way to use it.